A leaking roof is something you never want to come across in your home. On a rainy day when you’ve just settled in with a good book or a movie, you notice a drip coming from your ceiling. After placing a bucket below the leak, you go back to what you were doing, thinking it isn’t so bad and you can deal with it later. The truth is, that little roof leak can cause more damage than you think. Every time any water, whether rain or melting snow, comes into contact with the leaking area of your roof, you’re allowing more water damage to be done to your home. The water can damage insulation it passes through, which can lead to areas in your home for cold or warm air to escape. This escaping air will raise your utility bills. Along with physical damage to your home, a roof leak can pose health risks as well. Water exposure can cause mold and mildew to develop. Mold and mildew increase the potential for allergy irritation and inflammation, heighten the risk of asthma complications, and pose a concern for other health conditions. Any branches that dangle over your roof or gutter system should be trimmed back. They have the potential to break or fall off and land on the roof, causing immediate and costly damage. The same applies for branches already touching your roof. 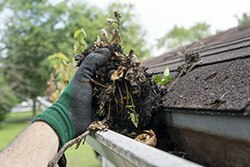 If your gutters are loose, have them reattached or replaced. Gutters direct water off a roof and down to the ground to help prevent build up and leaks. Along with making sure they are attached well, ensure the gutters are clean and free of clogs. 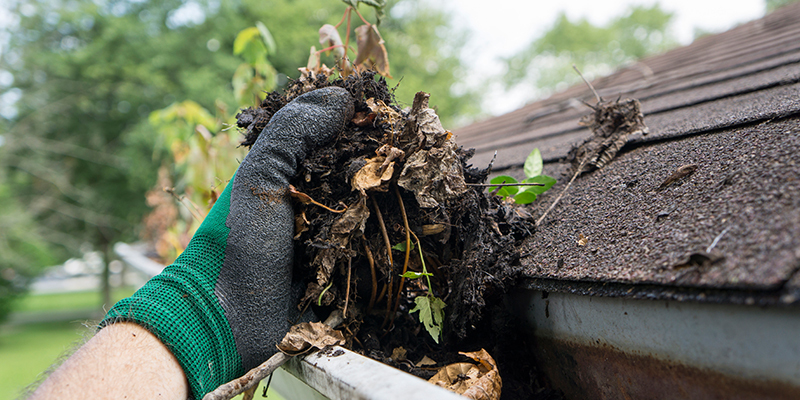 The gutter cannot drain the water adequately if there are pieces of debris like twigs and leaves blocking it. If there are any bricks around your home that appear loose or broken, have them repaired or replaced. This will help maintain the structural integrity of your home, and allow it to withstand potential leaks better. Make sure you maintain and replace your shingles to ensure proper waterproofing on your roof. Any missing shingles should be replaced, as should any cracked or loose shingles. The best time to deal with a leak is as soon as you notice it. Ignoring it and hoping it will resolve itself is never the answer. The leak will only get worse over time, leading to a more expensive repair and potentially much more damage to your home. Attempting to perform the roof repair yourself is not always the best approach either. Unless you know what you’re doing, you risk injuring yourself, and potentially making the problem worse. The best thing you can do is hire Can-Sky Roofing for an initial roof leak inspection to see the extent of your roofing issues. Can-Sky Roofing can then perform any emergency roofing repairs that are needed. 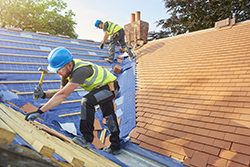 Their team of roofing experts can then provide you an estimate, and handle the repair for you. This way, you know it is done expertly and skillfully. They can also provide a preventative maintenance program, which consists of semi-annual preventative maintenance on your roof to ensure it’s performing it’s best. At Can-Sky Roofing, competency and efficiency are at the core of our values. For emergency repairs, contact us at 416-991-6783. For all other inquiries, including a free estimate for your roofing project, call 416-763-5131.